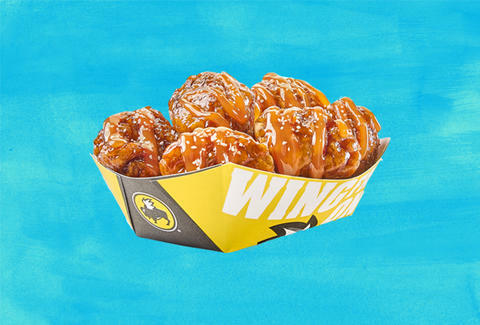 For a limited time, Buffalo Wild Wings is offering you the unique opportunity to indulge in a very strange pile of chicken wings. The wing hub's limited-time summer menu will include Salted Caramel BBQ Wings. Yes, caramel and chicken. The sweet new offering takes the chain's honey barbecue sauce and adds caramel and salt. It's a part of a series of releases that celebrate rivalries while the NBA and NHL playoffs are reaching their apex. The rivals here? Salty and sweet. Also among the rivalries, east and west coast beers with the introduction of Sam Adams New England IPA and Lagunitas IPA. Other items landing on the limited-time summer menu includes a Monster Pulled Pork Cuban sandwich, Smothered Cheese Steak Quesadilla, BBQ Chicken Sandwich, and Korean BBQ wings. Then there are those wings that are basically chicken wing nachos which will be available throughout the summer. In the end, the rivalry may just be between you and your willpower. All of it is only available through August 19. So, if you've always wanted to know what it'd taste like to throw caramel on chicken, this is the moment you've been waiting for.